Eyecon is one of the leading developers in the gaming industry. Founded in 1997, Eyecon first started as a computer game company before building an online casino system and gambling games in 1999. Their first game titled Temple of Isis was released in 2003 and is still one of the most popular slot games from Eyecon. They now offer over 60 uniquely themed games that can be enjoyed by players of all interests, from Fluffy Favourites to Stampede, there is lots of fun to be had. With over 6 billion spins a year, it is clear that Eyecon will be in the industry for a while longer. Play more uk slot games by Eyecon on Easy. Enter the land of luck with this Irish themed slot that offers spins for as little as 1p. The game transports players to the Irish countryside where everything is peaceful, green and serene. The background sounds and music is relaxing and adds to the atmosphere of the game. 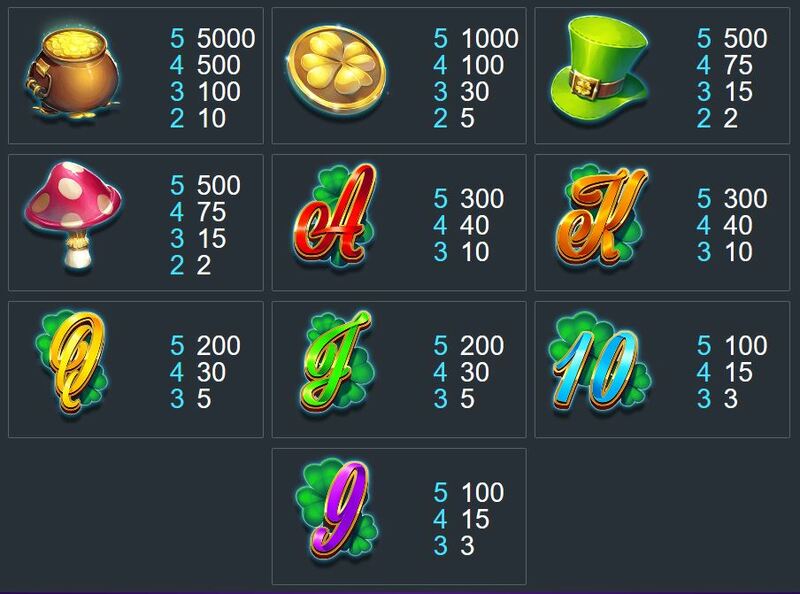 The symbols for this slot include playing card numbers and letters (9, 10, J, Q, K, and Ace), green hat, gold coin pot, golden clover, green clover and mushroom symbols. The lowest paying symbol is the playing card number 9 which rewards players with 3 coins when they and 3 in a row up to 100 for landing 5. The highest playing card is the Ace which pays up to 300 coins for landing 5 not the reels in one spin. The mushroom is next symbol that pays for landing 2 symbols although it is just 2 coins and rewards up to 500 for landing 5. The highest rewarding normal symbol is the pot of gold which can give you a generous 5000 coins when you land 5 symbols. The clover symbol is the scatter symbol and the lady leprechaun is the wild symbol. The Kiss Me Clover Jackpot has two great features alongside the main base game. Lucky Wheel Feature: When landing 3 or more of the clover symbols, you will trigger the lucky wheel. When triggered, the lucky wheel will appear for you to spin and gives you 25 free games. Players can win up to 100x their original stake. Gamble Bonus: At the end of some rounds you will be offered the chance to play the gamble bonus. If you choose to trust the luck of the Irish you will have the choice of two options where you will either double or your current or win nothing. The Lady Leprechaun works as the wild in this game can substitute itself for all other symbols other than the clover scatter symbol on the help to help form winning combinations. If you land 3 or more of this Irish Lady symbol you will win 3x more prizes. Landing 5 Leprechaun Lady symbols will also award you with 25 free casino games, 4 gives you 20 free games and 3 will award you with 15 free games. Spin today and learn more about how to pay by mobile casino. 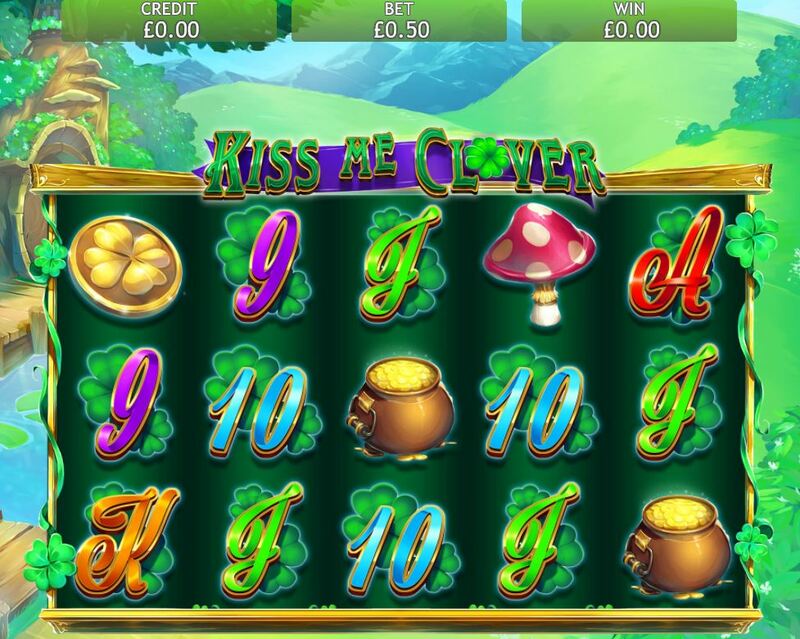 If you enjoy Irish themed slot games, the Kiss Me Clover Jackpot slot is certainly worth a spin. If you enjoyed Kiss Me Clover Jackpot why not try more online slot games here on https://www.easyslots.com/.